[First published on 28 September 2015, with updates. In our series of blogposts on Manuscript Studies, Mildred Budny sets the stage for an illustrated Report available for download here. 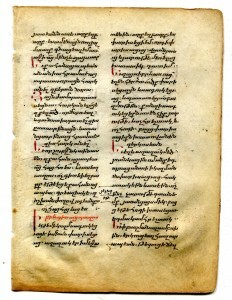 As part of the process of exhibiting images from manuscripts, documents, and other written materials — for example in our Galleries of Scripts on Parade and Texts on Parade, and in our Reports on Manuscript Studies — we offer a Report on ‘Two Detached Manuscript Leaves containing New Testament Texts in Old Armenian’ by our Associate, Leslie J. French. This Report is available below for download as PDF. In the form of a booklet, it presents its materials laid out in the official font of the Research Group on Manuscript Evidence, Bembino, a multilingual digital font (which you see on this website), and in accordance with the principles of our Style Manifesto. Such an approach resembles the presentation of our Newsletter ShelfMarks in booklet form, likewise available freely for download — as are the Style Manifesto and the descriptive booklet, with specimens, for Bembino. The font itself is also FREE for download here (now in Version 1.3). 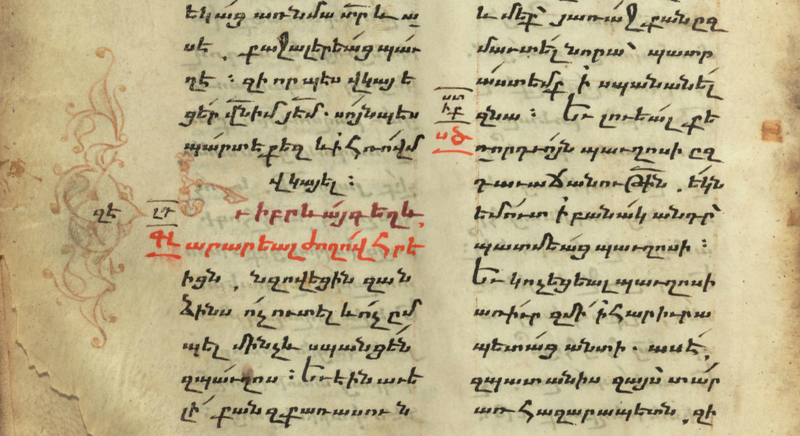 The Report examines and illustrates two detached leaves in Old Armenian which came to our attention when preparing their presentation among other specimens in various languages in our Gallery of Scripts on Parade. Then, identifying the passages of text and the elements of textual apparatus on the leaves proceeded hand in hand with an exploration of the available evidence, or records, for other parts of the same manuscript dispersed in several collections. Designing Armenian characters, lowercase and uppercase, for Bembino (in its next version, still in progress, responding to requests) allowed for the collation of the texts in full, as an aid to decipherment for readers who may be unfamiliar with the language or the medieval script forms. And so the booklet took shape. First, a description of the nature and context of the leaves sets the stage for the Report, which speaks for itself, images included. There the images are reproduced at larger scale. 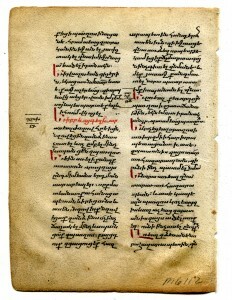 The two detached leaves, now in a private collection, came from a dismembered manuscript in Old Armenian written in bolorgir minuscule script of the 15th or 16th century CE. 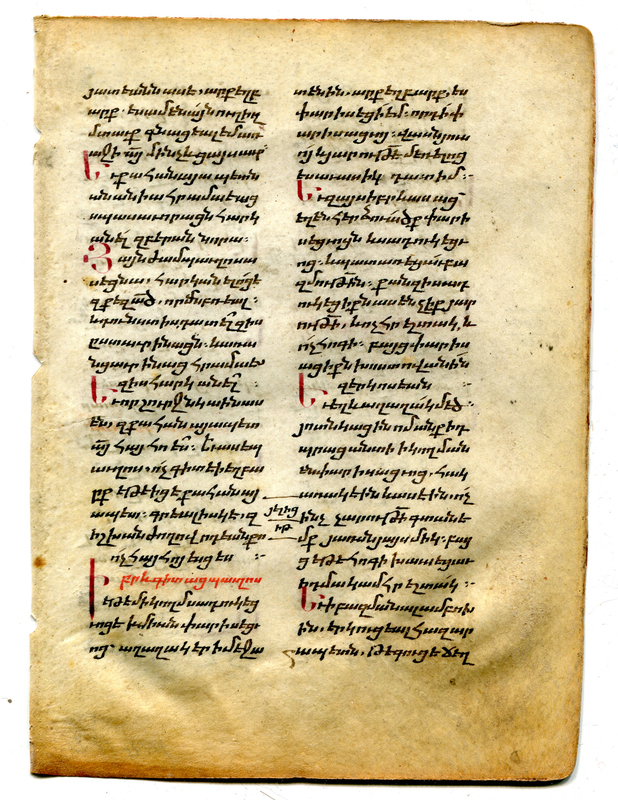 The remnants of its former manuscript contain parts of the New Testament (some say a Lectionary), plus a Prayer (or its opening line) and a Colophon (of unknown contents), now dispersed in parts among several collections worldwide. These 2 New Leaves were purchased from different sellers (both based in the United States), as parts of a manuscript dismembered at an earlier stage. That they belong to the same manuscript is undeniable on account of the similarities of layout, script, and other features. Within the manuscript, they stood at a distance of some leaves from each other — a number yet to be determined. Measuring circa 100 × 137mm (with a written area of circa 69 × 100mm), the leaves have double columns of 26 lines (with a run-over into a 27th centered line in one column). 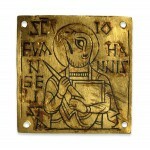 The text is written in black ink, with elements in metallic red pigment (partly oxidized) and bright vegetal red pigment. Each leaf begins abruptly within the passage of text. We show both recto and verso of the 2 New Leaves, newly identified as containing respectively portions of the Acts of the Apostles and Paul’s Epistle to the Romans, with the Euthalian Apparatus. This set of cross-references, devised apparently by Euthalius (active sometime between the 4th and 7th centuries CE), divides the text into chapters and verses, along with a system of cross-references, or testimonia, linking passages in the New Testament to Old Testament readings. The Report demonstrates the system in action. Leaf I carries part of the Acts of the Apostles (from within Acts 23:1 to within 23:19). Leaf II carries part of Paul’s Epistle to the Romans (from within Romans 15:23 to the end of 16:23). The leaves also have a few corrections, as well as a set of textual apparatus and cross-references. 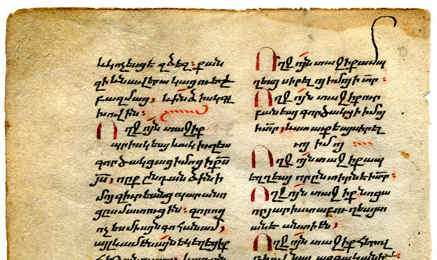 Simple embellishment appears in the contrast between the black ink of the text and marginalia and the red pigments of the the rubricated elements. Note the use of not one, but two types of red pigment. Opening initials, enlarged and mostly inset within the columns, are rendered in metallic red pigment, which has partly oxidized over time, with blackened bits. Some first lines of sections (Leaf I recto, column a and verso, column a) and the segmented section-ending markers (Leaf II verso, columns a and b) are written in vegetal red pigment, which remains bright. The vegetal pigment (on that same verso) sometimes overtraces the ink punctuation, and sometimes supplies the punctuation itself. Detail of verso of New Leaf I, with Acts 23:12 and notation in the margin for ‘Chapter 34’. Other leaves from the manuscript are known. Among them is MS 773 (likewise a detached leaf) in the Goodspeed Manuscript Collection at the University of Chicago. That leaf, known as the ‘Ananias Fragment’, contains part of the Acts of the Apostles (Acts 4:26b – 5:11), plus a ‘prayer’. With permission, the Booklet illustrates both sides of this leaf, and reports more of its features. Here, also with permission, we show details from each side of the leaf. 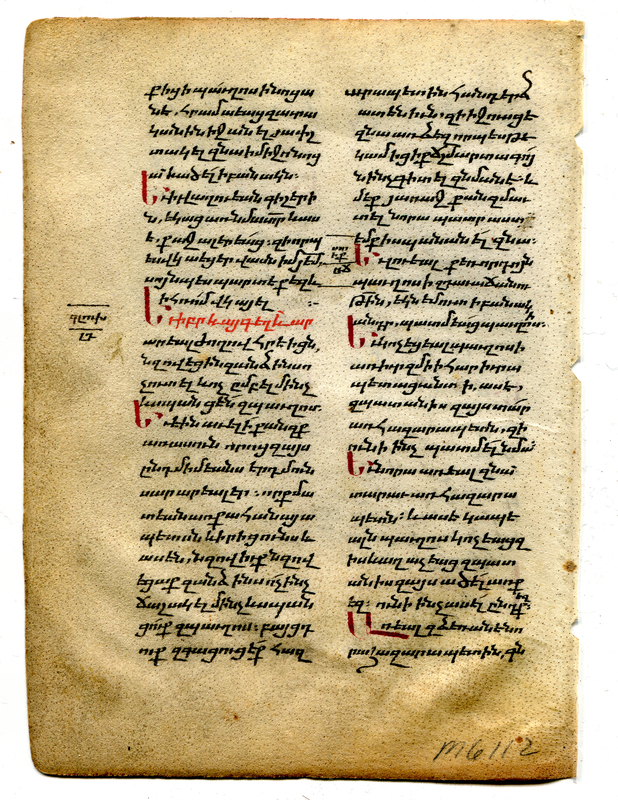 Another leaf with part of the Acts of the Apostles survives as Los Angeles, California, Philosophical Research Library, MS Arm. 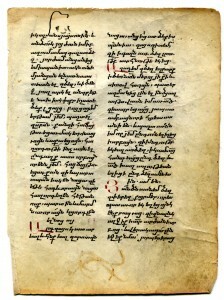 3 (Acts 24:5–25), described in Avedis K. Sanjian, A Catalogue of Medieval Armenian Manuscripts in the United States (1976), page 65. That is, although they stood at a distance from each other in the former manuscript, the Los Angeles Leaf preceded the Chicago Leaf in the sequence. Moreover, New Leaf I stood between them, at something of a distance from each, while New Leaf II within Paul’s Epistle to the Romans followed the Los Angeles Leaf, but not directly. 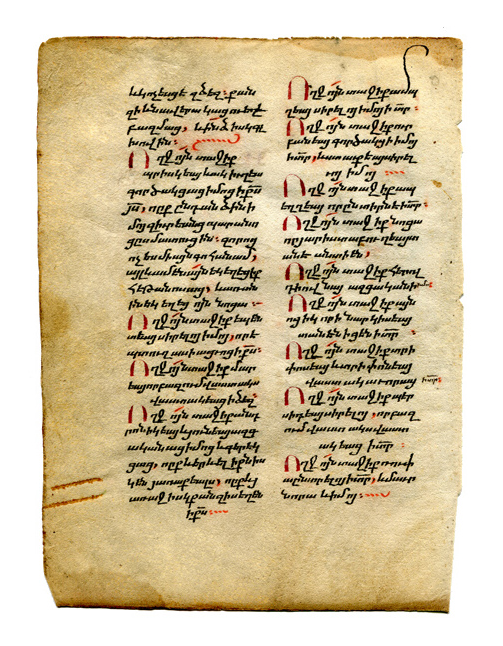 A larger portion formerly resided in the collection of Armenian manuscripts of Harry Kurdian (1902‒1976) of Witchita, Kansas, and now is presumably in Venice, Mekhitarian Monastery of San Lazzaro, which received his manuscripts following his death. These 16 leaves, partly continuous, are reported to contain parts of the Catholic Epistles (parts of James, I and II Peter, I–III John and Jude, plus a scribal colophon. As described while still in Kurdian’s collection by Allen Wikgren (December 1945), page 533, their fragmented texts form several groups, with leaves missing between each of them (folios 1–7, 8–9, 10–11, 12–15 in the Epistles) and between them and the scribal colophon (folio 16r). Tantalizingly, Witgren’s description mentions the scribal colophon but does not relate its contents, records the presence (but not the form or locations) of ‘Quire signatures’, observes ‘some red ornamental illumination in margins’ (ditto), and mentions the presence of the/a binding with ‘covers of wooden boards covered by brown leather with hand tooled ornamentation’, as well as 2 reused vellum front endleaves from an ‘early Latin commentary on part of II Samuel 9–10’. Without assuming that this is the form of red ornamentation in the margins of the Kurdian Fragment, we might observe the foliate embellishment in a manuscript, also in the Goodspeed Manuscript Collection, that is MS 229, which offers useful comparisons also in other ways for its coverage of the portions of text represented by both the Ananias Fragment and the New Leaves. More information about these comparisons appears in the Booklet, while the detail here exhibits a form of such a kind of marginal decor, which functions as a lively, undulating frame for the corresponding Passage reference, as a complement to the decorative opening initial in the text. One might wish to know more about these various features, while taking note of their existence. 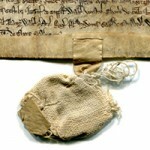 For example, it is difficult to know at a distance whether the reported binding was an original part of the production of the manuscript, a later addition, or a composite structure of several dates, with repairs and/or additions, including perhaps the reused front endleaves from a different discarded book. Among the range of extant bindings for Armenian manuscripts at such a date or later which employ brown leather with hand-tooled patterns, usually plus flap at the lower cover to enable a box-like cover, some examples — particularly for Gospel manuscripts — are described and illustrated here, with further directions for exploration. For comparison and context, we could note that Goodspeed Manuscript 229, comparable also in other ways, retains not only its 257 leaves of the New Testament, plus colophons, but also its brown-leather-covered binding with fairly simple decoration, shown online at both front and back. In the case of that manuscript, the several colophons and prayers cumulatively record the place of origin of the transcription, the nature of the exemplar, and the names of the scribe, his teacher, and the priest who commissioned the volume. Such features in full show what the dismembered manuscript represented only by dispersed fragments may have had to lose. We should not stop there. 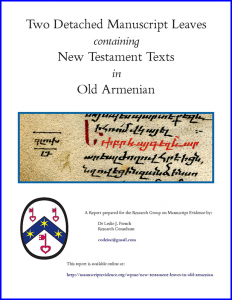 Recognizing that, say, to an Armenian manuscript specialist, an ‘early’ Latin biblical commentary for part of the Old Testament might mean almost anything in terms of date, particularly without an identification of its script and layout to offer some specifics, we may wistfully register awareness of a possible clue which that pair of reused endleaves — whether as a bifolium or separate leaves — might offer toward deciphering something more of the history and travels of the volume. Not to mention the possible significance for the transmission of biblical commentaries in the Latin tradition, including into other linguistic realms, even if simply as some accessible binding material for another text. 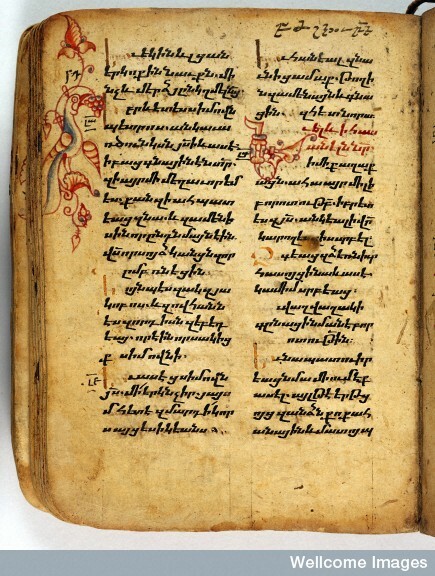 London, Wellcome Library, MS Armenian Manuscript 1, folio 120v. Image @ Wellcome Library, London. Via Creative Commons. Perhaps the imposition of the ‘lacunae’ among the groups of consecutive leaves in the Kurdian Fragment involved the extraction of desirable leaves with heightened decoration or illumination. The observation therein of ‘some red ornamental illumination in the margins’ does not give much to go on. 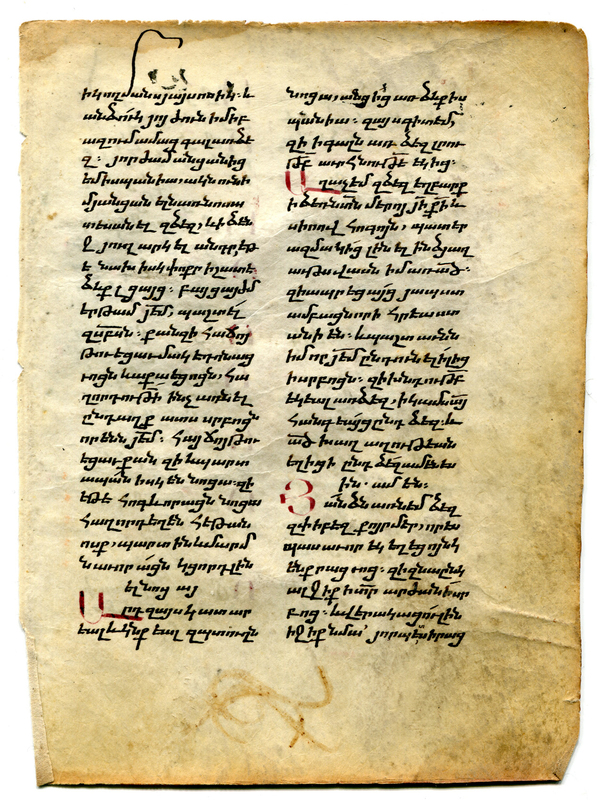 Examples of decoration in New Testament manuscripts written in bolorgir minuscule script include the Gospel manuscript of 1495 in the Wellcome Library, London: MS Armenian Manuscript 1, shown here within the Gospel of Luke (at Chapter 5:7–14). 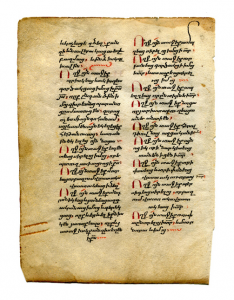 Some other cases of New Testament or Gospel manuscripts in bolorgir script involve much more elaborate decoration and illustration, with ornamental initials, historiated scenes, frontispieces, canon arcades, and more. 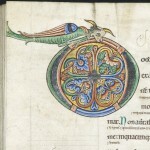 An example viewable online (only for some high points in terms of the ‘art’) is the Gospel Book now at the Morgan Museum and Library, MS M 749, dated 1461 CE. But there is no evidence in sight that the dismembered manuscript represented by the Remnants in the Los Angeles Leaf / New Leaf I / Chicago Goodspeed Leaf / New Leaf II / Kurdian Leaves attained anything approaching such heights of splendor. Instead, its isolated Remnants, as illustrated by the 2 New Leaves and the Chicago Leaf, resemble the mostly “plain” detached leaf of New Testament text in bolorgir script, with restrained red-and-black layout of text and initials, now part of the Metropolitan Museum of Art. As Accession Number 2009.65, it can be viewed online. We can report that its contents extend on the recto from within 2 Timothy 2:10 to the middle of 2 Timothy 2:20, and continue on the verso directly thence to the middle of 2 Timothy 3:5, with large red initials beginning Verses 11 and 14 on the former and Chapter 3 on the latter. An omitted word in 2 Timothy 3:3 is supplied in the outer margin, with a matching pair of o-shaped signes-de-renvoi above the omission point (column vb20) and above the form to be inserted there. Mounted on its own and presented digitally for all the world to see, this leaf, too, carries the burden of being witness to a much larger, and perhaps more elaborately embellished, whole. Such a fate resembles that of many in whatever languages. A recent example of gutting a 15th-century manuscript on vellum (albeit Latin), but leaving its covers, and selling the gutted residuals, is reported and illustrated as the reduction From a Book of Hours to a Book of Bits. Tracking the remnants of various manuscripts despoiled and dispersed by such practices forms the focus of several reports in our own series of blogposts on Manuscript Studies. The amounts of text missing from between the groups of leaves in the Kurdian Fragment — which, as described in the Report, comprise respectively 7, 2, 2, and 5 consecutive leaves, before the last leaf with the colophon — apparently indicate the losses of single leaves (designated with an asterisk, as ‘*1’) between those groups (7 + *1 + 2 + *1 +2 + *1 + 5), and an unknown number between them and the colophon, and between them and the preceding parts. Among those single leaves were the openings respectively of II Peter, I John, and I John 4. Perhaps embellishments of some kind(s) for the openings of such Books rendered their leaves attractive for and susceptible to extraction. No openings of the biblical Books appear to survive for this manuscript. Maybe there is a reason for that. As in, take the ‘good’ parts, discard the rest. But without more precise evidence, this form of guesswork is exactly that. The Report itself focuses upon the evidence of the New Leaves in particular, considering their materials, layout, text, apparatus, and language, with reference to the known (or knowable) features of other remnants of the manuscript, particularly the Chicago Leaf, and some relatives among other representatives of New Testament texts in Old Armenian in bolorgir script with Euthalian apparatus. The Report booklet is available for download in 2 versions. We have considered some options for printing which might be available to you. For this Report, Armenian characters in both lower case and upper case have been added to the next version (still in progress) of the multilingual digital font Bembino of the Research Group on Manuscript Evidence. For information about the font and its current version, free for download and use, see Bembino. We thank the owner of the New Leaves for permission to study and publish them. We also thank the staff and Director of the Special Collections Research Center, The University of Chicago Library, for permission to reproduce materials in the Edgar J. Goodspeed Manuscript Collection both in the booklet and here. Thanks are happily recorded to both Christine Colburn and Daniel Meyer for their help in responding to that request regarding the Goodspeed Manuscript Collection. Please let us know of other leaves from the manuscript. We welcome suggestions and improvements.